I am so pleased with this little man! He has a real spark, and he loves to move. Q’arnivale is airborne much of the time. Leaps, spins, pirhouettes – it’s all fun! I can already see that with his great “sit” and elasticity, he will be phenomenal mover and a prospect for upper-level dressage. Video below shows him stretching his legs at almost 7 weeks old. The pictures show him at 2 months and 2 years old. 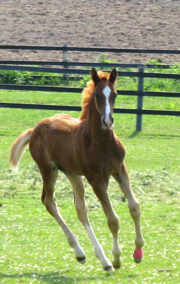 This breeding was my 5th attempt for a Quaterback foal, and so the success is especially savoured. 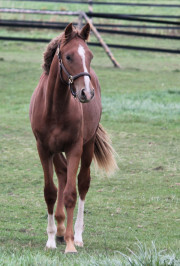 Q has beautiful type and natural presence, like all of Ditana’s foals. He has been SOLD to an Ontario Dressage trainer.